The Young and the Restless (Y&R) spoilers for Friday, September 15, tease that Victor (Eric Braeden) will gloat about saving the day. He’ll think his liquor license rescue proves that Nick (Joshua Morrow) needs help. Nick will argue with Victor until Noah (Robert Adamson) finally escorts his grandfather out. When Nikki (Melody Thomas Scott) shows up, she’ll ask for a moment alone with Nick. Nikki will reveal that Victor took a trip to Faith’s (Alyvia Alyn Lind) camp. He wanted to influence Faith’s opinion before Nick had a chance to share anything. Nick will be appalled by Victor’s attempt to spin this. He’ll decide that Faith needs to hear the real story. Afterward, Nick will break some bad news to Faith. He’ll point out that Victor forced him to leave the tack house. Faith will be distraught over her grandpa’s betrayal. She’ll confront him a little later and demand an explanation. Faith won’t understand how Victor could lie to her like that. Other Young and the Restless spoilers state that Phyllis (Gina Tognoni) will be on a mission. She’ll tell Ravi (Abhi Sinha) that they must have a mole. They’ll debate how Brash and Sassy got their latest Jabot info. Ravi will think somebody might’ve accessed the system electronically. He’ll promise to get to the bottom of it as soon as possible. Meanwhile, Jack (Peter Bergman) and Ashley (Eileen Davidson) will discuss how Graham (Max Shippee) possibly targeted Dina (Marla Adams). They’ll ponder his motives before Dina prances in. Y&R spoilers say Jack will remind her to leave Graham out of the loop. Dina will vow to keep his eyes away from Jabot’s files. Once Jack steps away, Dina will grumble to Ashley. She won’t like how they’re treating Graham, but Ashley just won’t believe he’s trustworthy. Dina will hand over the key to Graham’s suite so Ash can dig around. She’ll hope that this will satisfy Ashley’s curiosity and put the issue to rest. Dina will also have a run-in with Nikki before spotting Billy (Jason Thompson) and Phyllis. 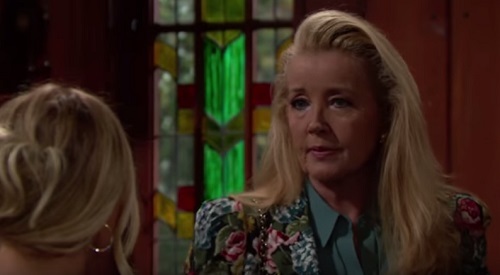 The Young and the Restless spoilers say Dina won’t hesitate to speak her mind. She’ll warn Billy to get out while he still can. Dina will be convinced that Phyllis is going to betray Billy just like she betrayed Jack. In the elevator, Victoria (Amelia Heinle) and Jack will put on a show for Nikki’s benefit. They’ll act like their truce is in effect. In Graham’s suite, Ashley will rummage around until she finds an intriguing form. It’ll show that Graham is paying $8,000 a month for a room at a retirement home. Ashley will realize Graham’s mom must be alive after all. Armed with new info about the liar, Ashley will head for the door. She’ll be taken aback when Graham suddenly appears. It sounds like Ashley will be in a tight spot! We’ll give you updates as other Y&R details emerge. Stick with the CBS soap and don’t forget to check CDL often for the latest Young and the Restless spoilers, updates and news.